Fan Sites, Fantastic Beasts Movie, Films, Fun, Leaky, Movies, News, Trailers, Videos, Warner Bros.
We’ve been plotting and theorising (and mainly hyperventilating) since the Fantastic Beasts: The Crimes of Grindelwald trailer dropped, but nothing beats first reactions. 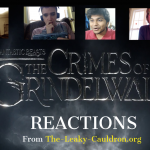 So, without further ado, here’s a selection of first reactions from some of The Leaky Cauldron staff. You might want to watch the trailer first, if you somehow haven’t already! We’d like to give special thanks to Jed Shaffer, (who you can find on YouTube & Instagram) for helping us put this together! Here we go! Oh, it’s Hogwarts! I’m already getting choked up! Who’s in the window? Which House? Who’s grandparents?? I don’t remember seeing the front entrance from that angle–the doors are massive! Ah-the postcard we’ve been seeing for so long. Can’t wait to go to Paris–will there be a premiere there? Love Jude Law as Dumbledore already! 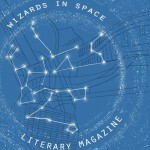 The new Wizarding World logo – nice. OMG – Grindelwald… Wait, Rosier is holding a prophecy? Who’s in the audience? Give us a close up! The time will come to pick a side, Newt – and Tina’s on screen – multiple meanings to that statement? Leta? Yay! Jacob got his memory back! Fogler’s so perfect! Queenie! And Bonnie – I mean Leta – love that Zoe Kravitz is in the ‘Verse! OK – image overload – what was that wall? The circus! 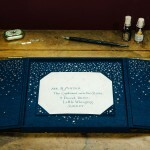 I can’t wait to see every detail of that – what a goldmine for MinaLima! OMG, Thestrals! Full on goosebumps! Newt has to be the one to take on Grindelwald? So glad we have four movies left to unpack Dumbledore and Grindelwald’s history! Who’s with Newt in the cemetery? I remember when we heard they were filming there. Can’t believe we still have 8 months to wait! Of course, after the second – okay, thirtieth – watch of the trailer (and counting), Leaky published a shot-by-shot breakdown which you can access here. We’ve also been posting our developing theories, which you can access here. So far we’ve covered everything from apparating on Hogwarts grounds to the return of The Deathly Hallows, so be sure to join in discussions! What were your initial reactions? Tweet us your thoughts and theories (@Leaky), comment on our Facebook posts or comment below! 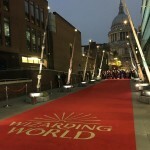 The Wizarding World Wand Installation Launches In London With Special Event!